LEXINGTON, Ky. (June 3, 2017) – American Flat Track fans, new and old, who turned out to attend the series’ inaugural race at the Red Mile in Lexington, Ky., were treated to a good old fashion showdown in the AFT Twins presented by Vance & Hines Main Event. After the dust had cleared, it was Jared Mees who took the victory lap with checkered flag in hand aboard his No. 9 Indian Motorcycle Rogers Racing Scout FTR750 in front of the sold out crowd of 6,500 people. As the evening’s program wore on, it become apparent that, for all of Bryan Smith’s Mile heroics in recent weeks, it was actually Mees and Sammy Halbert (No. 69 Estenson Logistics Yamaha FZ-07) who were set on a collision course at the Red Mile. Prior to the Main Event, the two backed up convincing Heat race wins with blowouts in their respective Semis – Halbert topping his by almost five seconds, and Mees his by a massive 13 plus. As expected, in the Main the two separated themselves from the pack almost as early as it started, even if they were rarely separated from each other by more than a tenth of a second for the next 25 miles. An action-heavy opening half saw the leaders repeatedly trade aggressive passes. However, after Mees was satisfied with his end-game preparation, the position swapping for the lead halted entirely. Instead, the Indian-mounted ace tucked in close behind Halbert’s Yamaha and waited until the final lap to strike. It was the practical application of a hard lesson in Mile strategy learned under the tutelage of Professor Smith; in his three recent consecutive Mile victories, Smith sat back and overtook his way to victory on the final lap each time out. And in the most recent two of those, Mees himself had been victimized on that pivotal circulation. However, Mees’ strategy very nearly fell apart when Halbert anticipated his desired move entering Turn 3. A perfect launch off the tricky Turn 4 provided Mees a second chance to make the pass stick, and he slipstreamed past by 0.013 of a second at the checkered flag to steal away the win. It was the fourth Mile victory of Mees’ career, and his first in almost a full year. After the race he said, “I basically just sat behind Sammy. He was getting through 1 and 2 so much better than me. I was thinking on the last lap if he got through there good enough I wasn’t going to be able to do anything with him. I tried drafting him around the outside, but I didn’t have enough on him. I just played my cards right. I’m surprised I got him at the line, but I got there. Halbert knew full well what Mees had been planning and thought he had actually foiled his rival’s last-lap hopes with a well-timed counter. He explained, “Jared and I had a good battle there at the beginning, and then he just kind of was looking like he was going to follow me around. I figured he was going to try to pass me going into 3 (on the last lap) because it seemed like neither of us could get the other before the start-finish line. And he went for that pass, but I protected the inside. He had to go around which is tough to do out here on this skinny groove. The second and third members of the Indian Wrecking Crew, Smith and Brad Baker, grappled throughout the race for third and fourth place aboard their No. 1 and No. 6 Indian Motorcycle Racing backed by Allstate Scout FTR750s. Late in the race, their fight forced them back into the clutches of Brandon Robinson (No. 44 Harley-Davidson Factory Flat Track Team XG750R) and Briar Bauman (No. 14 Zanotti Racing Kawasaki Ninja 650), transforming it into a four-rider scramble for the final spot on the podium. Ultimately, the honor went to Baker, who finally got the better of Smith on a big track following several recent near misses. Robinson rounded out the top five with Bauman close behind in sixth. “It was a great race; unfortunately it was for third place instead of first place,” Baker said. “I was just duking it out with my teammate. I felt like I was probably the fastest guy over here in 1 and 2, but I couldn’t do anything to save my life in 3 and 4… That was pretty much the story the whole race until the last couple laps I got something together where I was able to at least stay consistent in 3 and 4 and maintain and then blitz through 1 and 2. Smith’s fourth-place finish at the Red Mile leaves Mees as the only rider in the series with a perfect podium record intact on the season. The two title rivals are now tied atop the points standings at 152 apiece, although Smith holds the tiebreaker with four wins to Mees’ three. Kevin Stollings (No. 99 Ben Evans Honda CRF450R) appeared to be an unstoppable force in AFT Singles action on Saturday night at the Red Mile, powering to an apparent lopsided maiden victory. Stollings rarely put a wheel wrong and looked more like a crusty old vet cruising to a 20th career triumph than a youngster barreling toward his first. Unfortunately for Stollings, he was later disqualified and stripped of the win due to a violation of the series’ noise regulation. In contrast to Stollings’ lonely ride up front, the contest for second on track and, as it turns out, first on the results sheet, was intense. AFT Singles title favorites Kolby Carlile (No. 36 Parkinson Brothers Racing Honda CRF450R) and Shayna Texter (No. 52 Richie Morris Racing Honda CRF450R) were in that mix, as were Tristan Avery (No. 16 Ron Ayers Honda CRF450R), Brandon Price (No. 92 DPC Racing/Don’s Kawasaki KX450F), and Cameron Smith (No. 44 Carroll Motor Fuels Honda CRF450R), who had scrapped his way forward from the back row. In the end, Avery sliced forward and edged Texter for the (eventual) win – his first of the season. Carlile, Price, and Smith fell tightly in line just behind in third, fourth, and fifth, respectively. The 0.065 seconds that separated Texter and Carlile at the flag were enough for Texter to reclaim the points lead, 107-105, after losing it temporarily following a disappointing result the last time out at the Springfield TT. The Red Mile will air on NBCSN on Thursday, August 17, at 10 p.m. ET/7 p.m. PT. Catch the highlights on Facebook (https://www.facebook.com/AmericanFlatTrack/videos/1544666245567474/) and YouTube (https://youtu.be/pJseZrq17Gs). 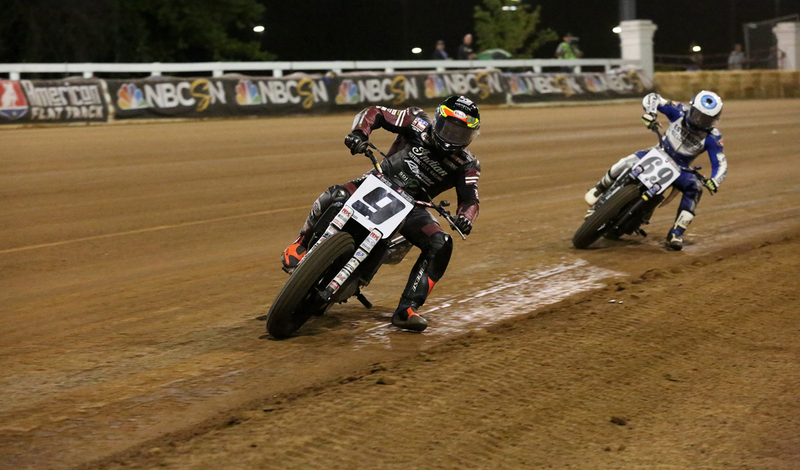 Next week, American Flat Track will complete its run of five Miles in six weeks with a stop at the OKC Mile presented by Indian Motorcycle, in Oklahoma City, Okla., on Saturday, June 17. Live coverage can be viewed on FansChoice.tv on Saturday beginning at 3:00 p.m. ET. Tickets are on sale and can be purchased https://www.showclix.com/event/okc-mile-general-admission/listing. Next → Next post: ROCKSTAR ENERGY HUSQVARNA FACTORY RACING’S JASON ANDERSON OVERCOMES THE ALTITUDE TO FINISH 2ND AT THUNDER VALLEY MX!